DUMBARTON lost a vital relegation battle against Ayr United at sunny Somerset Park 2-1. DUMBARTON lost a vital relegation battle against Ayr United at sunny Somerset Park 2-1 in front of a 1,600 crowd. Now the two teams are level on 31 points with St Mirren four behind, and Raith Rovers two ahead. Sons have a much better goal difference, but Ayr have a game in hand. The game started with all the urgency the late season, foot-of-the-table tussle demanded. Sons were aggressive in attack. It was breathless stuff. On 21 minutes the reward came. A Lewis Vaughan cutback found Robert Thomson, who fired home to give Dumbarton the lead. It was looking good for Sons, despite an Ayr pushback. Then in the very last moment of the first half some indecisive defending allowed the home side to equalise. A header hit the bar before Farid El Alagui nodded home the rebound for 1-1. Things became worse shortly after the restart. Robbie Crawford put United ahead from close range on 50 minutes after more hesitancy at the back. Dumbarton suffered a double blow on 70 minutes, when Darren Barr hobbled off injured moments after Garry Fleming, just on as a substitute, was red-carded for a challenge on Ross Docherty. Missed chances and passes also added to Sons' woes, before Ayr keeper Gary Fleming again denied Dumbarton by pushing a header wide. In the end there was no way back for Sons, with their opponents grabbing all three points from a frantic encounter. 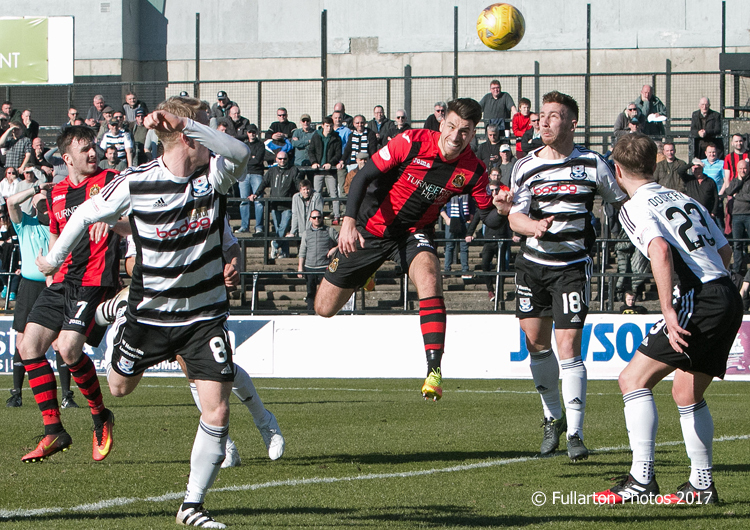 The picture shows Gregor Buchanan heading for goal.